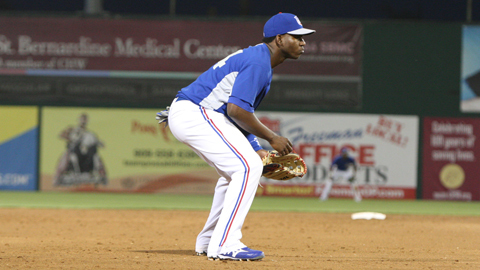 San Bernardino, Calif- Inland Empire 66ers third baseman Pedro Baez has been selected to the roster for the 2010 XM Futures Game, to be played Sunday, July 11 at 3 p.m., in advance of the All-Star Game in Anaheim. Baez, the 22-year-old third baseman, will be returning to the World team, having been selected for the Futures Game last year in St. Louis. His selection is a bit unusual, considering that he was on the disabled list for six weeks after suffering a dislocated shoulder. He also missed the last two months of 2009 with knee surgery. He is currently batting .284 with three home runs and 17 runs batted in in 37 games with the 66ers this season. In last years Futures Game in St. Louis, Baez came in as a pinch-hitter going 0-for-1, with a ground out in the Worlds' 7-5 victory over the United States. Los Angeles Dodgers infield prospect Dee Gordon will also join Baez as the only representatives from the organization. Gordon will play on the United States team. The 12th annual Futures Game can be seen live on ESPN2 and ESPN2 HD. For more information or tickets for the Futures Game visit AllStarGame.com. For information on 66ers tickets or to schedule your next fun filled group outing, contact the 66ers front office at (909) 888-9922. You can also buy your tickets online at www.66ers.com where in 2010 fans can print their tickets at home for free. For more information on 66ers baseball contact Inland Empire 66ers Director of Broadcasting Sam Farber at (909) 495-7632.